Next in the series on Riteway Meat Company is this Red Pepper Beef Jerky. See my previous review of their Home Smoked Beef Jerky and Teriyaki Beef Jerky. 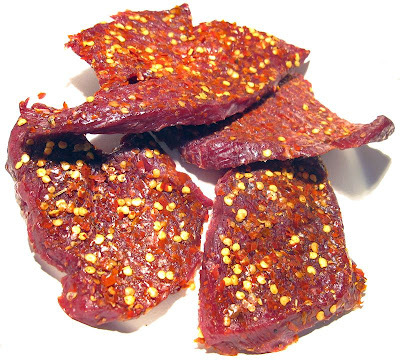 The company says the following about this Red Pepper Beef Jerky, "Thick cut, alder smoked and HOT HOT HOT, do we need to say anymore!" The first thing I taste from the surface of these pieces is a smoky flavor followed by a fair amount of saltiness. The chile pepper burn starts right away. I can taste some chile pepper flavor, but light. Overall, this jerky has a moderately intense surface flavor. In the chewing, the flavor I notice right away is a stronger saltiness, followed by a light meat flavor. 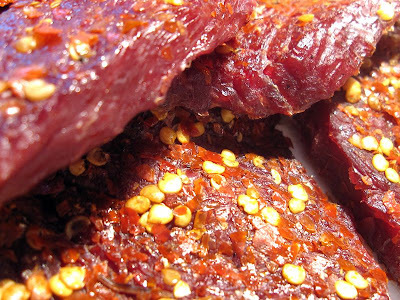 For being billed as a "Red Pepper" variety of beef jerky, it does have a light chile pepper flavor, mostly noticeable from the surface of these pieces. But there's a stronger chile pepper burn, which I'd rate on my hot scale as a "medium hot". It's not so hot that I can continue eating this bite after bite without pausing. But, it's still enough of a burn to make the eyes a little bit misty. It's the right amount of burn for my liking. Otherwise, the flavor that seems to stand out the most in this jerky is the meat flavors. It has a strong smoky flavor, and interestingly, the meat flavor resembles that of bacon meat. It's quite salty as well. The bacon meat description is not meant as a negative, I think it tastes very good, just not a lot like beef. The saltiness seems to be the second strongest flavor, with a high intensity level, but not quite "too high" for my tolerance. The spicy burn from the chiles seems to exacerbate the saltiness, making it feel more salty than it really is. The high salt intensity also seems to mask over the lighter chile pepper flavor. I find myself having to pause about 10-15 minutes in between bites if I want to find that flavor. Overall, what you're going to taste in this is a strong smoky flavor right away, a bacon-like meat flavor, with a good deal of saltiness, and some light chile pepper flavor. There's a good deal of chile pepper burn as well. In fact, this jerky seems very similar to Riteway's "Home Smoked Beef Jerky", with the only difference being the addition of red chile pepper. This is a semi-moist jerky, with a lot of moisture on the surface. Tearing pieces apart with my fingers requires some effort due to how thick these slices are, and due to some chewy sinews in the meat. Chewing seems a little tough. The chewing texture has a meaty, steak like feel, though it takes quite a few chews to get there. Each bite I take starts out feeling like a chunk of rubber, having a rubbery chewing resistance. But with some sucking and light biting, it eventually gives way, and chews down to a soft mass in about 20-30 seconds. I don't find any streaks of fat on these pieces, and found no gristle or tendon. However, the meat seems to be filled with chewy and stringy sinews that leave behind unchewable wads of tissue in my mouth. The pieces are also rather messy. The wet surface causes my fingers to pick up a lot of chile pepper flakes. Also, the toughness in tearing pieces apart requires me to hold a piece tight, and that produces even more finger residue. I'm also finding a lot of chile pepper flakes flying off as I tear pieces apart, and it's all over my lap. Riteway sells this Red Pepper Beef Jerky from its website at a price of $15.99 for an 8oz package. I bought three varieties of beef jerky from them, each at this price. Add to that shipping of $15.00, and the total came to $62.97 for 24oz of jerky. That's a price of $2.62 per ounce. For general jerky snacking purposes, at this $2.62 price per ounce, this jerky seems to provide a decent value. I'm getting a good deal of snackability from this, mostly from its good overall flavor, and it's thick sliced, semi-moist, meat consistency. I think the price is at the upper limit of what I'm willing to pay for the snacking value I'm getting back. As a "Red Pepper" beef jerky, at the same $2.62 price per ounce, it's also a decent value. I certainly do get a good deal of chile pepper burn from this, but only a light chile pepper flavor. Personally, I want a 50/50 split between burn and flavor. This Red Pepper Beef Jerky from Riteway Meat Company seems to be very similar in taste to their Home Smoked Beef Jerky, with the only difference being the addition of the chile pepper flakes. It provides a light amount of chile pepper flavor, but a stronger chile pepper burn. I had actually rated that Home Smoked Beef Jerky as "good" as well, saying that all it needed was a little extra something to push it over the top to a "best" rating. But I still don't feel this addition of chile pepper flakes to provide enough of a push. It still feels like it needs something more. Perhaps it needs more chile pepper flavor. While I do enjoy the chile pepper burn, what I really enjoy is the flavor of chile peppers. Despite the liberal coating of chile pepper flakes, I still didn't get a lot of taste from it. The higher salt intensity also erased much of that chile pepper flavor. Otherwise, on its own merits, it's still a good jerky. Very smoky, an interesting bacon-like meat flavor, and a semi-moist thick meat consistency. For my recommended beer pairing, try a red ale.